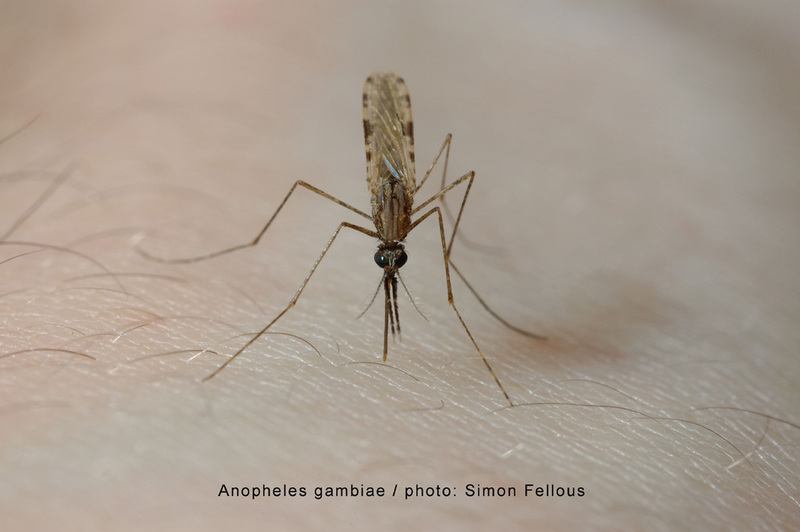 Anopheles gambiae, photographed by Simon Fellous. 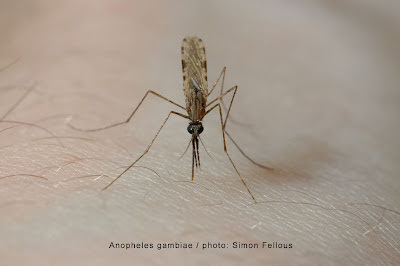 Anopheles is a genus of mosquitoes, distinguishable from others by their elongate palps. Many species in the genus are significant disease vectors, most notably of the malaria causative organism Plasmodium, and of various filarial nematodes. Females of Anopheles generally lay their eggs in permanent bodies of water; the elongate eggs are laid singly, and have membranous folds on either side that act as floats (Liehne 1991). Several subgenera have been recognised in Anopheles; members of the subgenus Anopheles have an entirely dark hind tarsus whereas the hind tarsus is partially white in A. (Nyssorhynchus) albimanus (Stone 1981). Members of the subgenus Cellia have numerous spots of white scales on the wings as opposed to the more uniformly dark-scaled Anopheles sensu stricto (Liehne 1991). Characters (from Liehne 1991): Clypeus longer than broad, rounded anteriorly. Palps of female as long as proboscis. Scutellum evenly rounded, without distinct lobes. Abdomen usually without scales or with a few loosely applied scales. Larva with head longer than broad, rotating freely; seta 2-C close to apical margin of head; setae 5-C to 7-C pinnate and aligned in distinct row across middle of head; mentum generally long and narrow; abdomen with dorsal palmate tufts on all segments; siphon absent; pecten on posterior margin of distinct triangular chitinous plate; setae 2-X and 4-X irregularly branched. [DW84] Dahl, C., S. Wold, L. T. Nielsen & C. Nilsson. 1984. A SIMCA pattern recognition study in taxonomy: claw shape in mosquitoes (Culicidae, Insecta). Systematic Zoology 33 (4): 355–369. [D51] Dobzhansky, T. 1951. Genetics and the Origin of Species 3rd ed. Columbia University Press: New York. [HF01] Hwang, U. W., M. Friedrich, D. Tautz, C. J. Park & W. Kim. 2001. Mitochondrial protein phylogeny joins myriapods with chelicerates. Nature 413: 154–157. [NNK72] Narang, N., S. Narang & J. B. Kitzmiller. 1972. 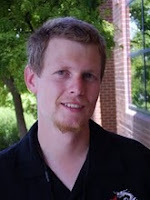 Lack of gene flow among three species of anopheline mosquitoes. Systematic Zoology 21 (1): 1–6. [W91] Waterhouse, D. F. 1991. Insects and humans in Australia. In: CSIRO. The Insects of Australia: A textbook for students and research workers 2nd ed. vol. 1 pp. 221–235. Melbourne University Press: Carlton (Victoria).